New Delhi: Rice, which is staple food for nearly half the world’s population, is also a major water-guzzler. It typically uses two-three times more water than, say, an equivalent quantity of wheat or maize. Now, according to a group of scientists, inserting a particular gene may improve rice’s water-use efficiency by at least 20%. The “hrd-D", a mutant gene, that’s been identified in a tropical weed called Arabidopsis, has been known to strengthen root systems, help plants better tolerate drought- and excess salt-conditions—typical traits of plants that grow in arid climate. Testing time: A woman plants saplings in a paddy field in Bhogpur, Punjab. 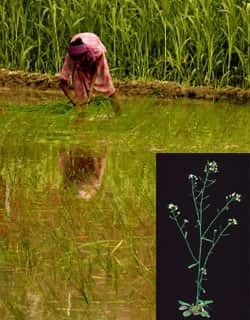 The GM crop, if it works, will prove to be a boon for water-starved India; (inset) the common garden weed Arabidopsis thaliana, in which the mutant gene hrd-D has been indentified. Reporting their findings in the peer-reviewed Proceedings of the National Academy of Sciences, Nataraja said the rice plant with the inserted gene had greener leaves, and thus better photosynthetic capacity, without any reduction in its growth or yield. “So, if you use a litre of water to produce a given amount of rice, our experiments show that inserting this gene gives the same quantity of rice, by using 700-800ml," he added. What this means for a water-starved India is significant. Water scientist and adviser to the World Wildlife Fund Biksham Gujja, said: “Freshwater is a precious resource in India and rice production typically consumes 30% of the available freshwater. Given that over 90% of India depends on rice, economical management of freshwater is a must." The scientists are part of a research team in the Wageningen Research Centre, the Netherlands, headed by Andy Pereira, which has sequenced the Arabidopsis genome. “We have access to the genome and our job was essentially playing around with the Arabidopsis genes. We are trying out various genes, and inserting them into crops of interest to us," said Nataraja, who specifically studies the drought tolerance aspect in crops, and itries to dentify genes that could help crops such as rice, wheat and maize. A lot of tests remain to be done. “This is an encouraging step, but we need to try this gene out with rice varieties specific to India, and practical results can be got onlyfrom field trials," cautioned Nataraja. Genetically-modified food crops are yet to be allowed in India, and the only genetically-modified rice varieties that are in preliminary stages of trials, are being tested for pest resistance. A lot, however, depends on the success of genetically-engineered Indian variety of “golden rice", which is still in preliminary stages of trials. “Golden rice" is a Swiss-developed genetically engineered strain of rice that’s high on Vitamin-A, though its possible entry into farmer fields has drawn ire from organizations such as Greenpeace in India. However, the Karabas’ research finding has evoked interest in the scientific community here. “It’s an interesting finding," said A.K. Singh, head of the water management division with the Indian Agricultural Research Institute, “but even we are developing rice varieties that use 40% less water, though they come with the caveat of strict fertilizer and sowing inputs.